air conditioner rental – only for Calgary area residents. With over 50 years of experience and a skilled and professional team right in the community, Reliance™ is committed to providing outstanding comfort solutions to all Calgarians. In fact, we understand the needs of our fellow Albertans because we live and work in your neighbourhoods. And you can always count on us to help determine what's right for your family – from the installation of a new system to duct cleaning, preventative maintenance, repairs and more. Hi, I'm Daniel MacDougall and I've been serving Calgarians in residential heating and cooling for more than four years. As a Reliance Presidents Award winner in 2016, I have a passion for customer service and look forward to helping you make your home more comfortable. I was honoured to serve in the Canadian Armed forces for nearly a decade and I'm proud to volunteer for Catholic Church food drives in my community. I've also been a Certified Fitness Instructor with Goodlife Fitness since 2003 – so, you might say, I know a thing or two about preventative maintenance! Hello, I’m Amy Shaw, a Home Comfort Advisor for Reliance, serving Lethbridge, Medicine Hat, and the surrounding areas. It’s my pleasure to walk you through all the ways in which a new heating and cooling system can improve not only your comfort level, but how you can improve the air quality for you and your family. I can also help you with any water heater, plumbing or water purification needs your family may have. I look forward to helping you find the best home comfort solutions at the best value. Reliance offers diverse solutions with options to suite everyone’s needs and budget. Let me show you how. Hi, I’m Mathew, the local Home Comfort Advisor for Reliance here in Red Deer and the surrounding areas. It's my pleasure to help you and your family make well-informed decisions about your furnace, air conditioner and indoor air quality needs. I can also help you find the right water purification solution for your family or help you find a protection plan that offers your family peace of mind. I look forward to helping you with all your home comfort needs! 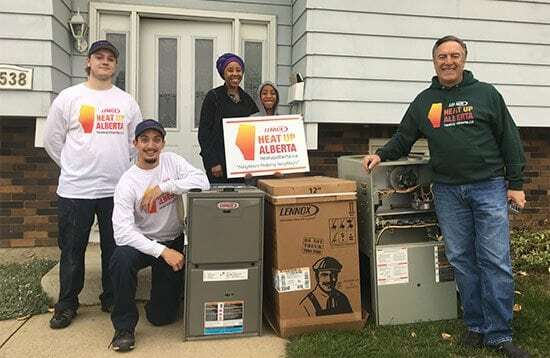 Providing members of the community with a high-efficiency furnace, courtesy of Lennox, with the installation donated by participating dealers and contractors. Show your support and nominate someone in your community that could use a helping hand. Click here to learn more & nominate someone today! We’re excited to announce some of the program winners! 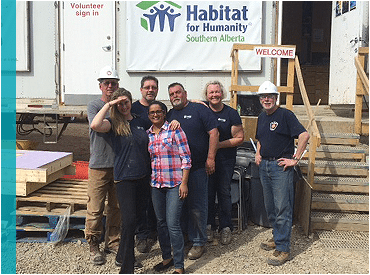 Assigbe Family (Edmonton, Alberta) – nominated for all their hard work and support in their community. Counselling, educating young adults and teaching cooking classes are just a few of the ways this family supports their local community. We’d like to thank the family for their service and congratulate them on their new lennox furnace, with complimentary installation by our Reliance technicians. Reliance is proud to recognize local heroes for their service and commitment to their communities. Do you have a hero in your community? Click here to nominate them now by telling us how they make the community a better place and they could be honoured at a future Stampeders game as our Reliance Home Comfort ‘Home Hero’! The Calgary Stampeders and Reliance Home Comfort are so proud to support the Heroes of Calgary throughout the 2017 season. 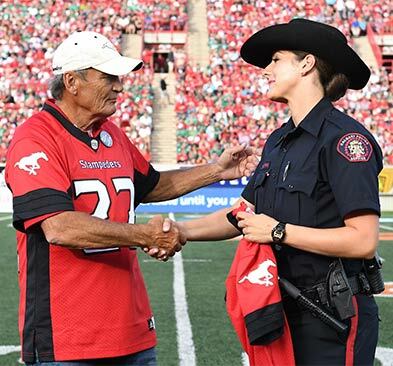 We’d like to recognize Constable Alicia Wilson of the Calgary Police Service and Tom Forzani, former wide receiver for your Calgary Stampeders. Alicia Wilson has been with the Calgary Police Service for over 6 years. In her time with the CPS, Alicia has quickly shot up the ranks and currently serves as a First Class Constable in District 4. In her spare time, Alicia is very involved with the Calgary Rage Women’s Football team and was named to the Women’s National Football team in January of this year. Tom, had an impressive CFL career and was named a CFL west all-star three times. Tom lead the Stampeders in receiving for 5 seasons and had 50 or more catches in 7 seasons. His number 22 was retired by the team in 1984 and his name was added to the Stampeders Wall of Fame in 1994. Thank you Tom and Alicia for all that you have done and continue to do for Calgary! 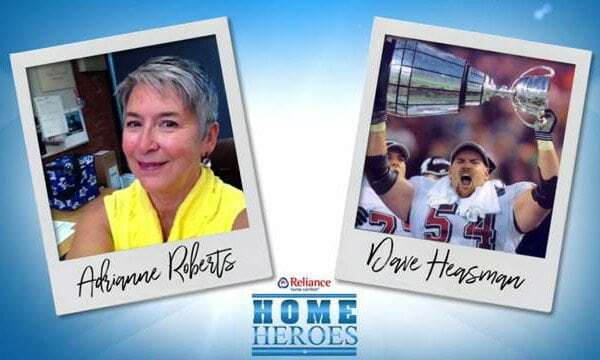 The Calgary Stampeders and Reliance Home Comfort would like to recognize Adrianne Roberts of the Calgary Fire Department and Dave Heasman, 2001 breakup champion, as Reliance Home Comfort Home Heroes. Thank you Adrianne and Dave for all that you have done and continue to do for Calgary & its community! View the in-game video of the Reliance Home Comfort ‘Home Heroes’ here. The Calgary Stampeders and Reliance Home Comfort would like to recognize Sgt. 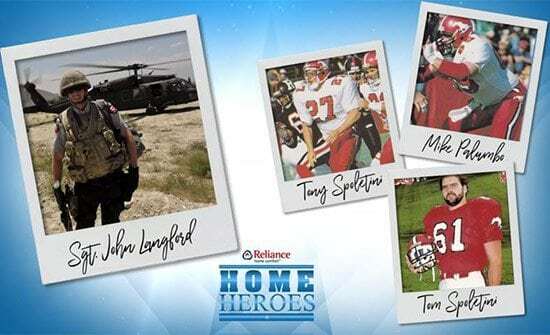 John Langford of the Calgary police services and Calgary Stampeders alumni Tony Spoletini, Tom Spoletini and Mike Palumbo as Reliance Home Comfort Home Heroes. Thank you gentlemen for all that you have done and continue to do for Calgary & its community! The Calgary Stampeders and Reliance Home Comfort are so proud to support the Heroes of Calgary throughout the 2017 season. 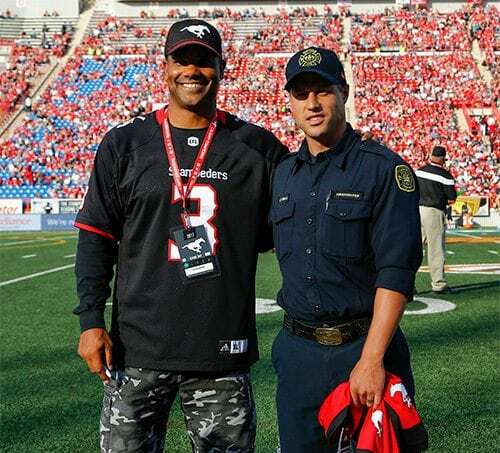 We recognize Matthew Bold of the Calgary Fire Department and Jackie Kellogg, former defensive back for your Calgary Stampeders. Matthew Bold has been with the Calgary Fire Department for over 8 years. During his career he has been called to several states of emergency including the Slave Lake and Fort McMurray fires. He currently serves the Mackenzie Town area. Jackie, had an impressive CFL career and was named a CFL west all-star twice. He played an integral role in bringing the Grey Cup back to Calgary in 1998! He currently serves as vice president for the Stampeders Alumni association and as the Alumni golf tournament chair. Thank you Jackie and Matthew for all that you have done and continue to do for Calgary! Received above and beyond customer service from Caitlin from Calgary as she helped a family member get all of the necessary information to make an educated decision. She was also kind enough to arrange for a very competitive price and they were pleased with the in home inspection as well. Great job. Been using Reliance on all my homes and the Calgary branch is very professional. From techs, to sales staff, to office admin, I recommend them if you’re looking for excellent work at a fair price! Daniel Mac came to my home today, in Calgary, he was very friendly and answered any questions I had. He checked out the equipment that reliance installed about 18 months ago and made sure it was all in good working order. And Daniel even made sure my friend and I are getting our customer referral bonus that we had forgotten to inquire about! Thank you Reliance and Daniel for your wonderful customer service!! I'll be a long time customer and would definitely recommend you!